Occide Jeanty and score from "1804" Marche Militaire. Centenary of the birth of Occide Jeanty, composer, Haiti stamp. Occilius Jeanty fils (junior), better known to Haitian audiences as Occide, was born in Port-au-Prince in 1860 during a period of relative political stability under President Fabre Geffrard. The young Jeanty was an elementary school student at the L'Ecole Polymathique de Coupeaud and attended high school at the prestigious Lycée Pétion. According to Dumervé (1968, 124), Jeanty was an indifferent student, preferring to sing children's songs to himself while beating time with his ruler or pencil. Occide Jeanty was part of a musical family. His mother was Mulerine Obin and his father was Occilius Jeanty père (1830-82). Occilius père was the director of the Ecole Centrale de Musique and a professor of mathematics at Lycée Pétion, as well as the director of the Corps de Musique, a military band attached to the National Palace in Port-au-Prince. In contrast with his son, Occilius père was a talented student, excelling in mathematics and music. We are told Occilius père was "conscripted" to play in the official band of Emperor Faustin I, and subsequently served five Haitian Presidents. Occilius Père encouraged his son, Occide, to study music from a young age. The younger Jeanty proved adept at music, eventually opening his own course of solfège at the Ecole Centrale de Musique under the Boisrond Canal regime. (Dumervé 1868, 60). In 1881, Jeanty was awarded a scholarship to study trumpet in Paris with Jean Baptiste Arban. Despite the backing of the legendary Arban, Jeanty failed to win the first prize for the annual instrumental competition at the Paris Conservatory. To make matters worse, political problems in Haiti caused Jeanty's scholarship payments to stop shortly after he arrived in Paris. A frustrated Jeanty played in the streets of Paris for money to support himself. His teachers in Paris included Arban (Jeanty’s principal instrument was the valve cornet), pianist Antoine-François Marmontel, and Douillon. Whether or not the rumors about Jeanty's behavior were true, his reputation was already damaged in the eyes of the Haitian government. Jeanty was recalled to Haiti and dressed down personally by President Salomon. Père R. P. Saint Clair, a priest of the Saint Esprit order who had served on the jury that awarded Jeanty his scholarship to study in Paris, arranged an audience with President Salomon and other well-respected musicians, including Edmond Roumain, Toureau Lechaud, and Louis Astrée père (Dumervé 1968, 125; Herissé n.d.). Jeanty's brilliant playing prompted Salomon immediately to appoint the young cornetist to the ranks of the Musique du Palais National, the Haitian president's official military band (Herissé n.d.). In 1885 he left Paris to become music director to President Lysius Felicité Salomon writing musique du palais in Port-au-Prince, where a street was later named for him, and a stamp issued in centennial tribute in 1960. Jeanty wrote at least eight processional marches, six funeral marches for Haitian dignitaries and their families, and four patriotic marches, as well as various polkas, gavottes, and méringues. Most of his works were originally written for the Musique du Palais National. His dance pieces were often scored for wind band so that the Musique du Palais National could play them in their weekly concerts on the Champs de Mars in Port-au-Prince. It was during his tenure with the Musique du Palais National from 1882 to 1916 - first as a cornet soloist and then as director of the group - that Jeanty turned his creative talents fully toward musical composition. Jeanty provided other official funeral marches, including two for President Florvil Hyppolite ("Chery Hyppolite" [Dear Hyppolite], and "Nos L'Armes"), one for Tirésias Augustin Simon Sam ("Ti Sam" [Little Sam]), and one for Nord Alexis ("Sur la Tombe" [On the Tomb]). Jeanty also wrote patriotic pieces, including the "Chant National" (with lyrics by Haitian poet, Oswald Durand) in 1897 and the commemorative march "1804" in celebration of the centennial of Haitian independence. Upon receiving the news of Lüders's sentence, Count von Schwerin, the German chargé d'affairs, bypassed the usual diplomatic channels and demanded a personal audience with President Simon Sam. Under pressure from the American legation, Simon Sam released Lüders on 22 October; Lüders left Haiti immediately. In order to further humiliate President Simon Sam, Schwerin called for German naval intervention. On 6 December 1897, the German ships Charlotte and Stein sailed into the bay of Port-au-Prince and the German navy demanded a $20,000 indemnity from the Haitian government, a salute to the German flag, as well as a four-hour reception for the German chargé d'affairs (Bellegarde 1938, 142). Occide Jeanty composed "Les Vautours de 6 Décembre" (The vultures of 6 December) shortly after the incident to protest the treatment Haiti suffered at the hands of the German navy. While Jeanty was experienced in writing patriotic music for the needs of the Haitian government - marches for Fête Dieu parades, two funeral marches For Florvil Hyppolyte - "Les Vautours" was Jeanty's first explicitly political work that was not geared toward presidential praise or military procession. Occide Jeanty engaged in his own version of cross-class performance with pieces written to evoke the folkways and mores of lower-class Haitians. His programmatic piece, "Coq, Poules, et Poussins" (Roosters, Hens, and Chicks), imitates the sounds of the barnyard, complete with crowing rooster courtesy of the saxophones, the cooing of the hen by the flutes and the chirping of the chicks from the oboes. Jeanty's polka "Pauvres et Pauvres" (The Poor and the Poor) (1901) is a "social satire criticizing the exploitation of the small by the great" (Herissé n.d.). Perhaps the most interesting example of Jeanty's interest in the cultural practices of ordinary Haitians came in his méringue, "Zizipan." A "méringue evoking the celebrations of yesteryear," "Zizipan" refers to a processional band that marched in the streets of Port-au-Prince during the Easter seasons of the 1880s (Herissé n.d.). While both Herissé and Corvington refer to this practice as "carnivalesque," it is likely that Zizipan was in fact a Lenten processional band from a tradition known as Rara. Despite its resemblance to Caribbean carnival traditions, Rara is a distinct cultural celebration that has close ties to Haitian traditional religion. Between 1922 and the end of the U.S. occupation in 1934, Jeanty resumed his regular duties as leader, conductor, and composer for the band. It was through his public performances with the Musique du Palais National that Jeanty created his most lasting impression as a defender of the Haitian nation. By performing pieces that had extramusical programs referring to Haitian political resistance, the Musique du Palais National, with Occide Jeanty conducting, became a symbol of Haitian resistance, albeit in musical, not military terms. Jeanty's most famous composition, "Dessalines ou 1804: Marche Guerrière" (Dessalines or 1804: War March) - known to Haitian audiences as "1804" - was another example of a work that, through performance, became an unofficial anthem of Haitian resistance and political autonomy until the end of the occupation in 1934. The march became an anthem of anti-American resistance for Haitians and continues to have revolutionary connotations for Haitian audiences. During the latter part of the occupation, Jeanty was forbidden to play "1804" with the band during their popular Sunday concerts in the Champs de Mars. Other bandleaders could perform the piece with impunity; only Jeanty was forbidden to lead the march. He was married to Lydia Robin. Their daughter, Lydia (born about 1910) was on the faculty of the Collège Louverture until her retirement in 1963, and served as Haiti’s ambassador to London for seven months in 1958. 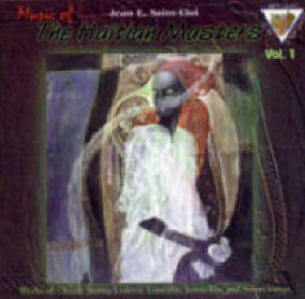 The classical guitarist Jean E. Saint-Eloi has recorded a CD entitled Music of the Haitian Masters, IFA Music Records 256 (1999). The music was composed for piano, but is performed on MIDI guitar. Among the works on the CD is a piece written by Occide Jeanty for solo piano, Invocation (5:00). Several other prominent Haitian composers of classical music are named in the liner notes. They include Justin Elie, Ludovic Lamothe and Solon Verret, whose works for solo piano round out the program of the CD and who have pages of their own at this Web site. Saint-Eloi estimates that Haiti has produced about 60 classical composers. 1804; Haitian march, for band. Les vautours du 6 décembre. Un choeur de nos heros. Southern, Eileen. “Jeanty, Occide (Fils)” in Biographical dictionary of Afro-American and African musicians. Westport: Greenwood Press, 1982, p201-202. (Greenwood encyclopedia of Black music).